The East Coast of Florida is host to some of the largest lobsters in the United States. Just ask anyone that frequents these waters. Lobster hunting can be a challenge to the novice diver, yet a ton of fun. Sea Dogs makes regular trips to the reefs to hunt "bugs". 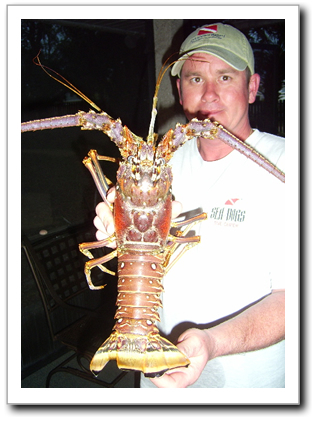 Check out David Earp's popular and informative article on lobsters. It's has some of the best information on lobsters and makes a good read. Recommended (and should be required), reading for anyone planning to go bug hunting! Reprinted below with his permission. He posts on the Spearboard and is a commercial fisherman. This article originally appeared in Spearfishing Magazine. 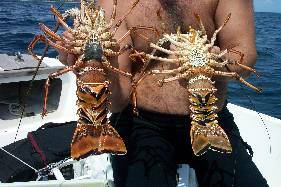 Since the early nineties I have been hunting lobsters pretty seriously in Southeast Florida. After several years of catching lobsters, you could say I have developed a pretty intimate relationship with them. Tom Matthews of the Florida Marine Research Institute has been gracious enough to identify some of my rarer catches, as well as to enlighten me regarding some lobster facts. One thing is for sure...the more you learn about lobsters, the more you realize how much is still not known about them. Tom’s work at FMRI makes it possible for all of us to enjoy lobster hunting and ensures that we will be able to do so for many years to come. One of the more common questions is...“Where do our lobsters come from?” This question may seem simple enough, but the facts are....over 25 years of intense research has been done on this topic, and we still can’t be certain where the lobsters originated. 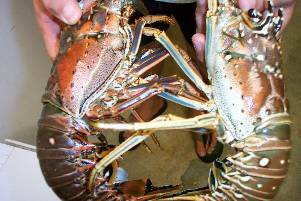 For example, it is thought that thelobsters in South Florida come from the eggs of lobster from other areas in the Caribbean. It's also theorized that South Florida larvae get transported to other Caribbean locations by large circulation patterns near the Sargasso Sea. In spring of 2000, I caught a Brazilian (or Smoothtail Spiny) off of Boca Raton, Florida. 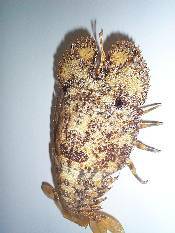 This lobster is rarely caught in Florida and indicates larvae from Brazil can get transported a long way from home. Lobsters reach sexual maturity in two to three years or when the carapace is just over three inches. State law requires a carapace to be over 3 inches before taking, thus allowing lobsters a chance to reproduce before harvesting. In theory, along with a closed mating season, this should keep lobster populations stable. Lobster mating season begins in the spring when the water temperature reaches near 74 degrees. Lobsters during this time can be observed walking out of their holes during daylight hours in search of a mate. Male lobsters can often be spotted sparring for a lady’s affection and occasionally we see them actually mating. Mating season generally ends in August, however, egg-bearing females are common through October and can be found throughout the year. Male lobsters can be recognized be their proportionately larger legs and carapace. Males tend to move around much more and are easier to catch than females. Females have a proportionately larger tail and extra branching pinchers on the bottom side of the tail or abdomen to hold the eggs once they are fertile. A female fertilizes her eggs by rubbing the tar-spot (sperm that the male has placed there during mating) on the underside of her carapace with her hind legs and mixing the sperm with the eggs. In a few weeks the eggs take on a dark orange color just before they hatch. Fortunately, it appears that lobster population in Florida is remaining stable for now. The Florida Marine Research Institute has monitored the influx of pueruli (the postlarval stage that moves from the open ocean habitat of the phyllosome to the nearshore habitat juvenile lobsters) for the past 15 years. However, there is concern that the increased level of lobstering throughout the Caribbean could reduce the number of larvae ultimately making it to Florida...making for interesting cross-border conservation issues. Most lobster hunters are also concerned about migration patterns...as these may determine whether or not there will be a good season in their respective locales. At the moment, this much is known about the migration of lobsters in deep water. Tagged lobsters in the Keys have traveled both north and south; suggesting lobsters walk in whatever direction they choose.It is known that after lobsters reach reproductive maturity they move from the nursery habitats to more open water environments and then move to avoid storms associated with cold fronts, or in advance of hurricanes. The 1999 and 2000 Florida lobster seasons on the East Coast were extraordinary. Statewide, 1995, 96, 97, and 99 were near record years, with over 7 million pounds of landings each. 2001 by contrast was the worst year in modern history, with a mere 3 million pounds landed. 2001 appears to have been an isolated year as the 2002 catch is estimated to be between 5.5 and 6 million pounds, but the FMRI has been unable to determine why the lobster population was so low for the 2001 season. They are currently obtaining landings records from around the Caribbean to see if it was a local Florida event or more widespread. Perhaps the absence of lobster migration was due to a lack of tropical systems and cold fronts that year…and will this winters numerous cold fronts make next season another extraordinary year? Another interesting fact…lobster coloration can provide insight into the recent movement of lobsters. Just like us, lobsters "are what they eat". Lobsters predominantly eat small snails or clams, but these are covered in algae that are incidentally eaten by the lobster, which in turn gives the lobsters a color matching it’s habitat....Mother Nature at work! Green algae is common in shallow water, and red alga dominates more in deeper water. For the most part, shallow water lobsters have a greenish tint, while deep water lobsters have a reddish tint, and the deeper the lobster lives, the redder the tint.If we take this to the next step, we can determine the recent movement of the lobster. Finding a reddish lobsters in shallow would indicate lobsters are moving in, or if we find greenish lobsters in deep water, that would indicate a movement toward deeper water.As a general rule, we find lobsters moving deeper in late summer and fall, perhaps to weather tropical systems and winter storms in deeper water.In the springtime they tend to move in shallower for the mating season. Besides the common Spiny lobster, Florida is home to other species. A favorite of night divers is the Spanish lobster. They are small, quick, and tasty. They are more commonly seen at night, along the reefs when they come out to feed. There is no season, size or bag limit on Spanish or shovelnose lobsters, and may be taken as long as they are not egg-bearing. We also have three varieties of shovelnose (or slipper lobsters), the “Spanish Slipper”, the “Ridged” recognized by its candy-cane striped legs, and the “Sculptured” identified by its saw-tooth edges. Unlike the spiny, the shovelnose does not have antennas, instead it has well-developed plates around its head to dig through the sand to search for food. The Spanish Slipper is most commonly seen, followed by the Ridged, which is relatively rare, and rarest of all is the Sculptured. 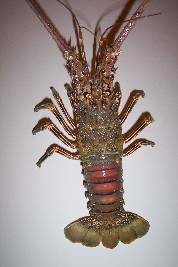 There are also two species of clawed lobsters, the copper lobster and the long-armed spiny. Because of their rarity, they are the most prized catch for the lobster hunter. Of the Brazilian lobsters or “Smoothtail Spiny”, a total of 9 were reportedly caught in Florida in 2000-2001, although the number actually caught is probably much higher considering my dive buddy and I caught a total of four, and the FMRI caught two themselves. These were the first reported since 1949 when hundreds were caught off of the Southeast Florida coast.Could they be making a comeback here…or will they not be seen again for another 50 years? Now for the important stuff! What is the best method to catch Florida lobsters? Again, we must understand a little about lobster behavior. Lobsters have two long antennae under each eye. These antennae are used to scare off predators. This is why you will sometimes see a lobster come out of his hole; point his antennae straight out and challenge you...I love it when this happens!Lobsters have two smaller antennae-like structures called antennules that sense water movement.This means you should take your time, so as not to alarm the lobster. The most common methods are: the net and tickle stick, and the looper. 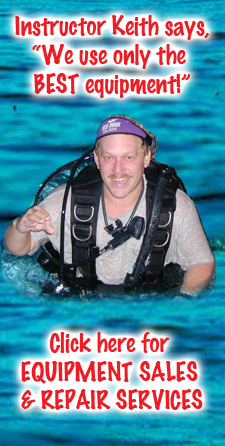 Many years ago I had a dive buddy that invented a low-profile lobster net, which we named after him, the “Harley Net”, available at Force-E stores in South Florida. The narrow design allows you to get into small crevices and moves less water not to spook the lobster. I’ll never forget what my mentor, Andy, told me “Lobsters are like cattle, you can herd them wherever you want, as long as you take your time.” I follow that advice, and I have acquired a few other helpful tips. 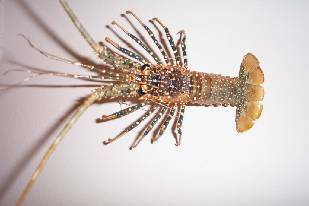 For one, I always use an aluminum tickle stick...never plastic, as lobsters do not respond as well to plastic. Tap or nudge the lobster from behind to move him into position, and put the net over him, and he’s trapped! With a traditional wide lobster net you must tickle the lobster completely out of the hole and into the stationary net, a more time consuming and riskier technique.Measure the carapace to make sure it is over 3 inches, check for eggs (by the way, extra skittish lobsters often have eggs), then place in your catch bag, and enjoy your dinner!